Hello! - this section is a bit about me - to understand how I work and how my art has evolved and arrived at where it is now. After completing A levels I embarked on a History of Art and Design Degree. I soon realised this was too removed from the practical artwork I was used to and enjoyed. 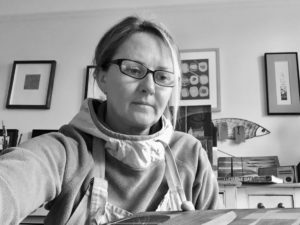 Whilst thinking 'what next' I changed tack and worked in Social Care for 15 years in London, simultaneously maintaining my art practise privately and learning new skills and mediums through evening courses. For several years, as part of my job, I coordinated and ran art groups for Adults with varying Disabilities. The project was well resourced so ceramics, painting, drawing, batik, crafts, collage and screen printing were all on offer and provided me with a foundation in many artistic areas. Eventually, I worked solely for Deaf and Hearing Impaired people in North London becoming proficient in British Sign Language. A change of life and a move to Devon in 2006 meant I was able to pursue my art practise more formally. 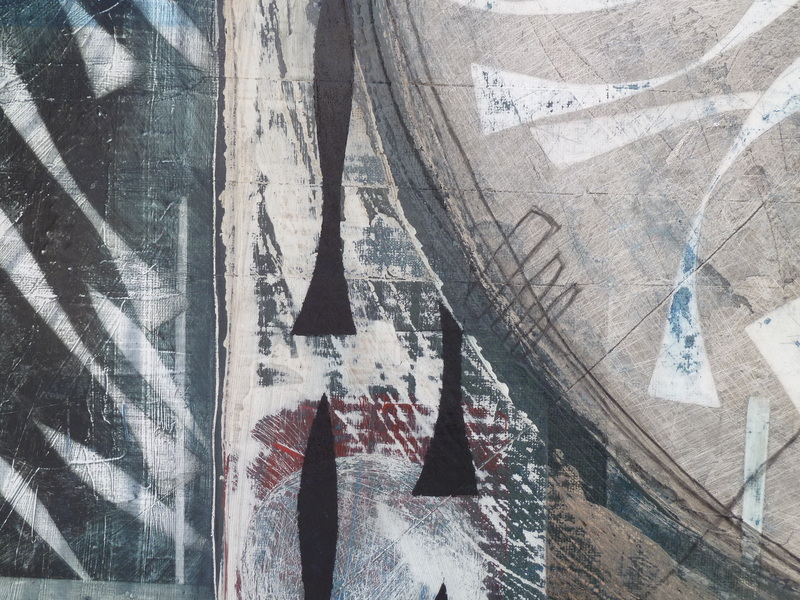 I attended a course in 2009 at the Double Elephant Print Workshop in Exeter, which lead to a new enthusiasm for printmaking and painting with opportunities to start exhibiting and selling work. 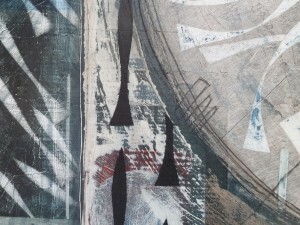 After investing in my own press I now enjoy Associate Membership at the Double Elephant workshop and keep abreast of all latest news that way in the South West printmaking world. I have two, quite different, strands to my work. My paintings are semi abstract reflections of the South West coastal and rural landscape. Boats, coastlines, nautical paraphernalia, the moors, seasons, glimpses of images, textures and repeat patterns. Once I have a design in mind I have a fluid, evolving process on the canvas board or wood panel which is relatively instinctive - layering, scoring and sanding to eventually gain the balance and colour I am happy with. I paint using cut cloth, paper and oil colours. However, I also use acrylics, charcoal, carborundum and other media to build up texture and base colour. Most of my prints are created by the drypoint, intaglio printmaking process. This method involves engraving the plate, smearing with sticky oily ink, working it into the lines and wiping clean. The plate with recessed ink remaining is then hand pulled through my print press under high pressure, on to the dampened cotton rich archival quality paper. I individually hand water colour my work to add colour or apply hand painted tissue (chine collé), or use embossing techniques at the time of pulling the print, to create colour and texture. The hand tinted 'towns' series have become popular commissions and are thoroughly fascinating to work on - researching the area, representing a place accurately in a narrative design to create a small limited edition. I have been commissioned to do 'life-maps' for private clients along the same theme - making individual one-off portraits fulfilling the past, present and future aspirations of the clients life within the artwork. I live on the south coast of Devon in Teignmouth, UK.